The coaster isn't uber-thrilling (not that it was intended to be), and the show part of it is a bit on the short side (no Dwarfs pun intended). The coaster is, however, thrilling enough to satisfy ride warriors, but accessible enough for riders of nearly all thrill tolerance levels. And the show elements are exceptionally cute and appealing. Type of ride: Steel coaster with some dark ride features. Could you handle it? It's not designed for smaller kids like the nearby kiddie coaster, The Barnstormer. It's fast and thrilling, but not that fast and thrilling. There are no inversions. 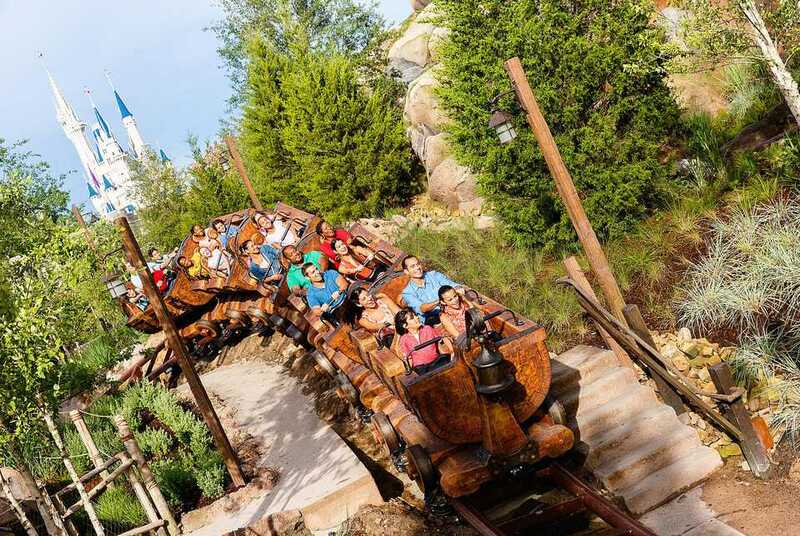 If you are OK on the Magic Kingdom's other mine train ride, Big Thunder Mountain Railroad, you'd be fine on the Seven Dwarfs Mine Train. Located in the middle of New Fantasyland, the Seven Dwarfs Mine Train is the literal and figurative centerpiece attraction of the Magic Kingdom land. Guests can walk the entire perimeter of the dramatic ride and see its mine train cars snaking in and out of its low-slung mountain. Continuing on to the mine, guests encounter some interactive elements to help keep them occupied while waiting to board the ride. Disney has been incorporating amusing diversions in the queues of its recent and updated attractions. (It's a great idea and begs the question: What took them—and other parks—so long?) Among the activities is a gem washing game in which guests move electronic facsimiles of precious stones in a sluice and match them. Each car on the five-car trains holds four passengers. Featuring a first-of-its-kind coaster design, the cars can independently pivot from side to side, somewhat like a baby's cradle. (That’s just one of seven cool features of the Seven Dwarfs Mine Train Ride.) The amount and intensity of the swinging (which never gets all that intense) depends largely on the weight distribution of the passengers. If two hefty dads sit on the right side of the cars with their two small children occupying the seats on the left, there wouldn't be as much rocking as there would be in a more balanced car. An interesting attribute and benefit of the swaying cars is that they are able to absorb some of the lateral (side-to-side) G-forces since they can freely pivot. When the train travels through a turn or a banked curve, the passengers and the cars sway together. In a traditional coaster train, the cars remain stationary, and the passengers absorb the brunt of the G-forces. In more intense coasters, riders can slam into the sides of the cars or into their coaster buddy sitting next to them. It's also worth noting that the cars toward the rear of the train swing more and offer an overall more thrilling ride. If thrills are your thing, hold out for the rear car; if you'd prefer a bit tamer ride, opt for the front car. After taking off inside the station, the train exits for some mild outdoor maneuvers and climbs the first lift hill. Mining equipment can be seen alongside the tracks. Some relatively gentle hills and curves get the cars swinging before they slow down to enter the mine. Like other hybrid coaster/dark ride attractions, such as Universal's Revenge of the Mummy, the trains are capable of delivering coaster-like thrills as well as behaving like slow-moving ride vehicles. Inside the mine, passengers first encounter Dopey who is, as you might expect, gloriously happy while he works (but, alas, not whistling). As with the rest of the tableaus, the scene is brightly lit, the props, such as the colorful gems, are rendered beautifully, and the soundtrack, featuring songs from the classic film, sounds great. But the character itself is a show stopper. Disney's Imagineers have been experimenting with the combination of traditional animatronic figures and projected digital mapping imagery. The expressive eyes on the tiny Sebastian the Crab in the Little Mermaid ride, for example, are rear projected onto the moving figure. The Dwarfs characters represent the next evolution of the marriage between animatronics and projected media. The eyes, mouths, and other features of the comparatively large figures (they may be Dwarfs, but they tower over Sebastian) are animated with remarkable fluidity. Dopey and his six co-workers heigh ho away with a level of authenticity heretofore not possible. It seems especially appropriate that the Dwarfs characters would come to life with projected imagery since the circa-1937 Snow White and the Seven Dwarfs was the first full-length animated feature. The train exits the mine via a second lift hill. Projected onto the rock work are silhouettes of the Dwarfs marching to work. It was created using a scene from the original film. The train takes a satisfying plunge, accompanied by just a hint of airtime, and banks to the right as it navigates a helix. After a few more twists and turns, it returns to the station. Before entering the unloading area, there is one final scene. We are not going to give it away (and hope we have't divulged too many spoilers already), but we will implore you to make sure that you and your co-passengers turn to the right—and remain turned to the right—for a nice finale surprise. The Seven Dwarfs Mine Train is a wonderful attraction. It is groundbreaking, undeniably charming, and a great gateway coaster for young coaster fans. It is also a fitting centerpiece for New Fantasyland. With its toned-down thrills and truncated show scene, we wouldn't say that it is an E-Ticket ride, however. It is certainly a strong D-ticket and, ahem, a gem of a ride.